Amaze your friends and family by creating a beautiful writing instrument made from wood. 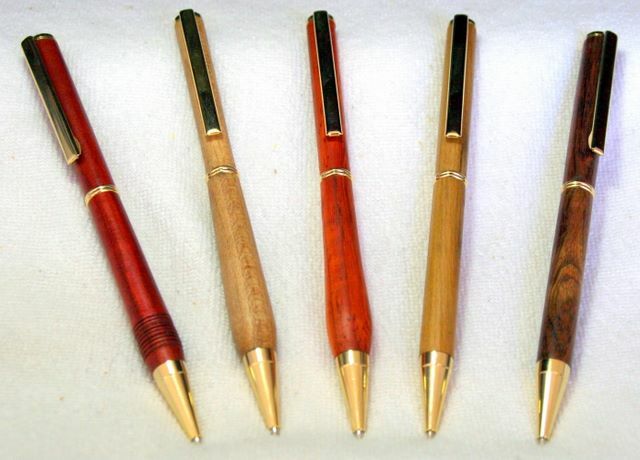 Turning wooden pens is a very satisfying and rewarding pastime, needing very little extra equipment and in a short time you will be turning pens to delight and fascinate any lucky recipient. There are many different styles of ball point, roller ball and fountain pen as well as propelling and click pencil. They are all available in a variety of finishes ranging from gold and silver to chrome plating and when combined with the choice of hundreds of wooden and man made pen blanks, all tastes and styles are accommodated. The equipment needed to start turning pens is very basic and only requires a few specialist items in addition to your normal woodturning tools. These items are available from most good woodturning retail outlets as well as more accessories to help turn quantities of pens when you become more proficient. The following is a brief description of the tools and equipment that will help you create your beautiful writing instruments. The choice of blanks is endless and covers the full spectrum of wood available for turning as well as many varieties of man made materials and natural media such as stone and animal horn. When choosing your pen blanks try to remember that when turned a pen has very little surface area, in comparison to a bowl for example and can look too plain if the material used is too bland. When choosing a wooden pen blank ensure that it has an interesting figuring or if you are going to use a man made material select one with colour contrasting ripples. Also be aware that some woods such as Paduak and Purple heart have a very vibrant colour when first turned but due to the effects of sunlight and air they become very dull and uninteresting. Pen blanks vary in size from approximately ½" - 1" square and 4 ½" - 6" long, so ensure that you select the correct size blank for the specific pen that you are going to turn. If you have any doubt when you are first learning it would benefit you to use a bigger blank and turn it down, than get a small one only to find it is too small once you have finished turning it. If you are going to use the more exotic woods such as Snake wood, Cocobolo and Kingwood, ensure that the blank is dry and free from any faults or cracks as these will cause you problems when you start to drill and turn them. It is recommended that you turn using a lathe speed of 2500rpm or faster to ensure a clean cut on such a small surface area. Most wood turning lathes have this capability, with small more compact lathes being more suitable to pen turning although pens can be turned on any size of lathe. Pens can be turned using standard woodturning tools, with the size and type of tool used varying with personal choice, although the tools required are normally a combination of a roughing gouge, spindle gouge, skew and a parting tool. There are also specific pen turning tool sets available on the market and the tools in these sets have been chosen for ease of use and suitability for pen turning. 14cm x 1cm A lovely unique hand turned pen made from Cocobolo wood and high quality gold plated fittings with black inlay pen clip. SOLD A lovely unique hand turned pen made from Santos Rosewood and high quality gold Plated fittings with black inlay pen clip. 14cm x 1cm A lovely unique hand turned pen made from tropical wood and high quality gold plated fittings with black inlay pen clip.